Taking the lead from the government’s comment that the scope of copyright exceptions is a “complex issue”, this article raises three questions that could benefit from further discussion during deliberations on the Productivity Commission’s recommendation that a US-style fair use standard be incorporated into Australian copyright law. First, it asks whether Australian courts would derive much guidance from US case law, given the doctrinal uncertainty that exists in US fair use jurisprudence. Second, it questions whether an Australian version of fair use would necessarily be applied in cases involving new technological uses of copyright protected works, rather than the production of new works of authorship. Third, it asks whether sufficient attention has been given in the fair use debate to the incentives needed to create functioning markets for copyright-protected works. 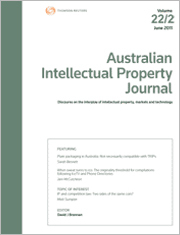 For the PDF version of the table of contents, click here: AIPJ Vol 28 No 3 Contents.